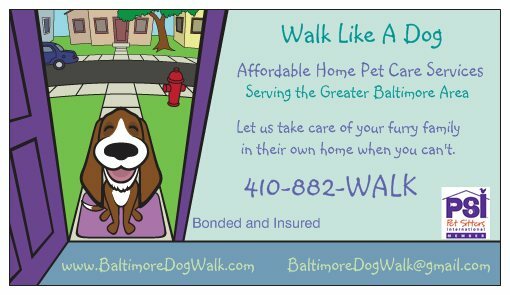 Baltimore Dog Walking Service: Baltimore pet care. If you’re like most pet lovers, you hate leaving your pet alone all day while you work, go to school or in unfamiliar surroundings when you travel. You can arrange for friends and neighbors to take care of your pet at home, but often they’re too busy and you don’t like to impose. Walk Like A Dog truly loves animals. With us, you are assured reliable and responsible service. Stay in a secure, familiar environment. Follow their customary routine and diet. Avoid exposure to illness from other animals. You can leave home with peace of mind knowing that you’ve left your home and pets in our good hands. We communicate via phone calls or texts with photos to let you know how your babies are doing while you are away on vacation so you have peace of mind knowing they are being well taken care of and are happy. Our service provides your dog, cat, and/or other pets the care they need while you’re away at work, school, on vacation or anytime you can’t – right in your own home. Multiple visits each day as needed. Even overnight stays can be arranged.